The mission of the College of Education is to prepare students to teach, lead, counsel, and model life-long learning; engage in scholarship that provides new pathways to meet the needs of a dynamic, diverse society; and facilitate access to learning opportunities that are authentic, student-centered, and technology-rich. We envision a College of Education that continues to grow in its national recognition for excellence and innovation in teaching, scholarship, and outreach; and becomes the choice for novice and experienced professionals desiring a high quality, flexible education to help them meet their individual intellectual and career goals. Georgia Southern University was founded in 1906 and has enjoyed a long history of preparing education professionals. The bachelor’s degree in education is the oldest professional degree at Georgia Southern, and from 1924 to 1955, the entire institution focused exclusively on preparing future teachers. With reorganization of the institution’s academic divisions in 1968, the School of Education was created to consolidate the teacher education programs. On July 1, 1990, Georgia Southern received university status, and two years later all “school” designations were changed to “college” thereby establishing the College of Education. In 1992, the College of Education initiated the university’s first doctoral program, the Doctorate of Education, which was also the first doctorate to be offered by an institution located in South Georgia. On Dec. 12, 2017, the University System of Georgia Board of Regents approved resolutions making the consolidation Armstrong State University and Georgia Southern University official as of Jan. 1, 2018. The name of the new, consolidated institution is Georgia Southern University. With the merger of both institutions, the new Georgia Southern University College of Education offers degree programs on both campuses and online. For a full listing of programs please visit our COE Education Degree Programs web page. Today, the College prepares future teachers, school psychologists, counselors, school library media specialists, instructional technologists, researchers and leaders through intensive field experiences, cutting-edge technology and research-based instruction. The College of Education offers five undergraduate Bachelor of Science in Education majors preparing students for initial teacher certification. At the graduate level, the College offers the Master of Arts in Teaching degree with six available concentrations, 13 master of education degrees, eight education specialist degrees, and two doctoral degrees. The College also offers eight certificate opportunities and six graduate-level programs for educators seeking to add an endorsement to their certification. For a full listing of programs please visit our COE Education Degree Programs web page. Statesboro, located in Bulloch County, is a rural town of about 35,000. 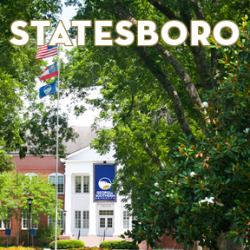 The Statesboro Campus enrolled over 20,300 students for fall 2017. 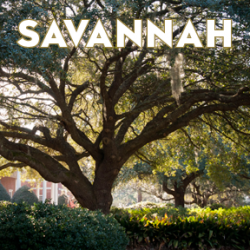 Savannah, located in Chatham County, is historic city of nearly 150,000. The Armstrong Campus enrolled 7,150 students for fall 2016. 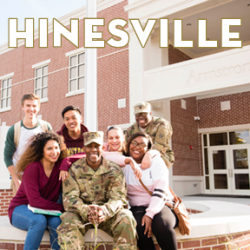 Hinesville, located in Liberty County, is a town of about 35,000 and houses Fort Stewart. The Liberty Campus enrolled nearly 500 students for fall 2017. Students can pursue two Associate Degrees on this campus – Associate of Arts and Associate of Science in Core Curriculum – as well as all fully online programs.